The programs at ACDN empower children to build self-esteem and confidence in their ongoing development. Children are grouped by age as well as development level so that each child’s individual needs can best be met. 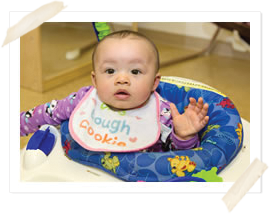 In our infant program, each child's individual sleep, play and feeding needs are attended to by a warm and loving staff. Caregiver to child ratios are kept small to ensure that personal attention can be provided. Your baby's primary caregiver is a nurturing child development professional focused on keeping your baby happy, engaged, and secure. We develop a personal care plan for each infant based on his or her unique schedule, nutritional guidelines, and any other special attention he/she requires. Sensory development and the mastering of motor skills like standing and walking are always encouraged. Age-appropriate play structures, manipulatives, toys and sensory materials are provided to foster ongoing learning and development. Daily updates are provided for parents documenting each child's eating, sleeping and diapering along with a synopsis of the day's activities. Teachers understand that the parent-child relationship is primary and parents are encouraged to call anytime with ideas, questions, or concerns. 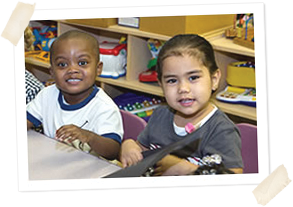 Our toddler program affords children an array of opportunities for learning, developing important social skills and gaining positive self-confidence. Daily curriculum consists of enriching activities centered around sensory, cognitive and language development. The toddler room contains well-planned learning stations that allow for child choice, self-directed play and small groups. Explorations of texture, color, patterns, size and shape, smell, taste, weight are regularly encouraged. Music, art, movement, circle time, imaginative play, discovery/science and history are all part of the daily curriculum. In addition, children begin to learn letters, numbers, colors and shapes in a manner designed to encourage a love of learning. Gross motor skills are supported through physical activities and outdoor play. The pre-kindergarten curriculum reflects the growth of the child's intellectual, social and motor abilities, which allows them to explore activities and projects in greater depth. Teachers encourage creative exploration through art, music and movement. Children also experience a rich variety of learning experiences including science, math, cooking, dramatic and sensory play. Early reading, writing and spelling are introduced for kindergarten readiness. 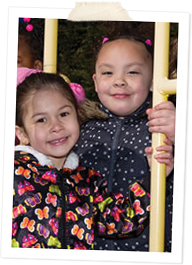 In both the toddler and pre-kindergarten programs, regular age-appropriate special events are held throughout the year, including field trips, in-class visitors (i.e. travelling Cape May Zoo, magician, gymnastics), classroom "theme" days, seasonal celebrations, class birthday parties and a year-end kindergarten graduation ceremony.